Thundra is a fictional character, an anti-heroine appearing in American comic books published by Marvel Comics. She is often aligned with the Fantastic Four. She is a powerful, red haired, amazon-like warrior, or Femizon, from a matriarchal, technologically advanced future timeline where men have been subjugated by women. Cover art for Hulk: Raging Thunder #1. Thundra was created by Roy Thomas and John Buscema, and first appeared in Fantastic Four #129. Art by John Byrne and Terry Austin. Thundra is a warrior woman and time traveler from an alternate future 23rd century. In the future society she hails from, planet Earth is now known as Femizonia and is ruled by amazon-like female overlords (Femizons) who have conquered and enslaved the diminished male population. The former United States is now the 'United Sisterhood Republic', and Thundra hails from the megalopolis of Greater Milago (a merged sprawl of Milwaukee and Chicago), located in the United Sisterhood's Midwestern Republic. Thundra is renowned as the United Sisterhood's most formidable warrior, having been physically enhanced by genetic engineering and trained from childhood in combat, the martial arts, and military strategy. She is sent to the 20th century to challenge Fantastic Four member the Thing to a bout of one-on-one combat, believing him to be the strongest male of all time. By beating the Thing in combat, she feels she can prove once and for all that women were superior to the male gender, and finally end a stagnant war between Femizonia and the warlike, male dominated planet of Machus, where the female population had been subjugated by its ruler Mahkizmo. Thundra is also recruited into the evil group of supervillains known as the Frightful Four by the Wizard, and they battled the Fantastic Four. She secretly has her own agenda and has no real interest in the group. She battled the Thing in personal combat, and then wound up ultimately switching sides and helping the Fantastic Four defeat the Frightful Four after she quits that group. She later battled the Hulk, who was possessing the Thing's body at the time. Thundra later assisted the Fantastic Four against the Frightful Four again, and then assisted the Fantastic Four against Namor the Sub-Mariner. Her time travel from 23rd Century Femizonia, an alternate future ruled by women, to prevent the formation of Machus, an alternate future ruled by men, was finally revealed. Alongside the Fantastic Four, she battled Mahkizmo. She ultimately remained in the 20th Century after a dimensional interface of Femizonia and Machus occurred. She later assisted the Fantastic Four and Tigra against the Frightful Four, and then assisted the Fantastic Four, Tigra, and the Impossible Man against the Brute, Mad Thinker, and Annihilus. Thundra later met wrestling promoter Herkimer Oglethorpe, and on his advice she became a professional wrestler training with the Grapplers, a group of female wrestlers who possess cybernetic-endowed superpowers. In a fixed wrestling match with one Grappler member, Thundra (who has superior strength and fighting skills) is secretly drugged by her opponent, causing her to black out and lose the match. When she awakens, it was revealed that the Grapplers were actually agents working for the Roxxon Oil Company, a multinational petroleum company which was covertly involved in developing advanced technology and weaponry for sinister motives. The Grapplers were assigned to trick Thundra into helping them sabotage Project Pegasus, a prison/research facility built for housing supervillains. They were employed the smuggle the Nth Projector out of Project Pegasus. As a result of the deception by Roxxon and the Grapplers, Thundra came to blows (yet again) with the Thing (with whom she has expressed a romantic interest in, on more than one occasion). Alongside the Thing, Quasar, Giant-Man, and the Aquarian, she fought the Nth Man. She encountered the duplicate Hyperion and the Avengers, and battled Ms. Marvel. She is briefly allied with the duplicate Hyperion while still in service to Roxxon, and with him stole the Nth Projector from the Nth Command, before she returned to an alternate Femizonia which did not interface with Machus. Sometime later, Thundra was revealed as the Empress of Femizonia. She teamed with the Thing to battle Machan rebels. She later abducted the Avengers and Fantastic Four to the future to enlist their aid in defending Femizonia from the extra-dimensional warlord Arkon and his warriors from Polemachus. She fought Arkon in personal combat, and became romantically inclined toward him. Medusa and Crystal infiltrate Thundra's present-day homeland in order to retrieve part of a device required to rescue Black Bolt from the Skrulls intent on weaponizing him. As tensions between the two disguised women boil over, Thundra appears and compels them to undertake the ritual combat required of the society to resolve the disagreement. Thundra is convinced to hand over the Skrull intelligence agent after Crystal makes an impassioned speech. Thundra, Sue Storm and Valkyrie team up with She-Hulk and her Skrull partner Jazinda (masquerading as a Shi'ar) in order to forcibly distribute stagnating aid in the corrupt country of Marinmer. The Red Hulk battles the Lady Liberators and tricks them into believing they caused him to pass out. Red Hulk then kidnaps Thundra, and offers her an alliance after deducing she was the only one of the group that was willing to kill him. After agreeing to the alliance, Thundra becomes a subordinate of the Intelligencia, a group of genius villains founded by Leader. 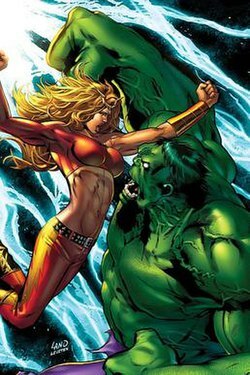 After Red Hulk is betrayed by the Intelligencia in the "Fall of the Hulks" storyline, Thundra aids him in his escape and leaves the group. Since her departure from the group, her daughter Lyra has joined their ranks. As a result of genetic engineering, Thundra has vast superhuman strength and resistance to physical injury sufficient to allow her to stand toe to toe with the likes of the Thing. Her speed, stamina, agility, and reflexes are heightened to the peak of natural human capability. She has undergone intensive pain-management training. Trained as a warrior, with extensive training in the hand-to-hand and military combat techniques of the 23rd Century, she is a seasoned combat veteran who possesses superior fighting skills and is considered to be the greatest warrior among her people. Thundra is also a skilled combatant with a sword or her three-foot linked chain, the latter of which is her weapon of choice, often attached to a bracelet on her left forearm. Thundra also appears in the Marvel Comics Maxi-Series Avengers Forever. In the storyline, she is a member of a rag-tag remnant of Avengers in an alternate future where Earth has been devastated by evil robotic alien invaders from Mars. She still wields a chain as her personal weapon. Unlike the other remaining Avengers (most notably the Black Panther), it appears that Thundra has not aged. Perhaps this is due to the Femizonian genetic engineering that she was subjected to, the source of her superhuman abilities. A future version of Thundra took cell scrapings from the Hulk which were used by scientists in the future to impregnate her. This Thundra later gives birth to a green skinned daughter who is the child of herself and the Hulk. [volume & issue needed] This child, Lyra, is later nicknamed "She-Hulk". [volume & issue needed] She later returns to the future to insert Lyra's birth. Thundra appeared in JLA/Avengers in the prologue where she is seen on Polemachus in bed with Arkon. He offers to take her hunting, but Krona appears and destroys Polemachus, Thundra and her entire universe. At the end of the series everything is restored to normal. In Marvel Zombies: Return: Avengers, Thundra is shown to be a member of the Sentry's undead group along with Super-Skrull, Quasar, Moon Knight, Namor the Sub-Mariner and Quicksilver. She argues with Quicksilver that she will not eat the meat of men because she will not let her perfect warrior's body be "tainted by flesh with the Y-chromosome". After being lured to the Savage Land by The New Avengers she is ripped in half by a zombified Hulk. Thundra was ranked 62nd in Comics Buyer's Guide's "100 Sexiest Women in Comics" list. Thundra appears in Ultimate Spider-Man, voiced by Tara Strong. She first appears in the pilot episode "Great Power" as a member of the Frightful Four. She returns in the following episode, "Great Responsibility," where the Frightful Four nearly capture Spider-Man. Thundra is defeated with help from Power Man, and is last seen hanging bound and gagged from a building. When Peter describes each of the Four he refers to her as "a ruthless warrior woman from an alternate future timeline" and adds a "Don't ask" about her history. Thundra is a playable character in the Facebook game Marvel: Avengers Alliance. Thundra appears in several cards in the mobile card game Marvel: War of Heroes. ^ Frankenhoff, Brent (2011). Comics Buyer's Guide Presents: 100 Sexiest Women in Comics. Krause Publications. p. 42. ISBN 1-4402-2988-0.